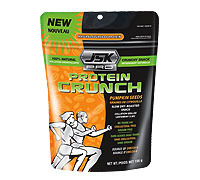 JSK Pro Protein Crunch is the delicious protein snack for high-energy people on the go. Made 100% from only natural ingredients - no artificial flavours, sweeteners, colours or preservatives. Each serving is a source of protein, energy, and omega-3 & omega-6 polyunsaturates. JSK Pro Protein Crunch is a healthier snack choice because it is free of cholesterol and trans fat. And a healthy diet containing foods high in potassium and low in sodium may reduce the risk of high blood pressure, a risk factor for stroke and heart disease. JSK Pro Protein Crunch is low in sodium.